Robots are not bound to the same familiar forms. Without needing to protect a soft, fleshy core, machines can be built at new scales and with strange locomotion, all in service of a strange body. 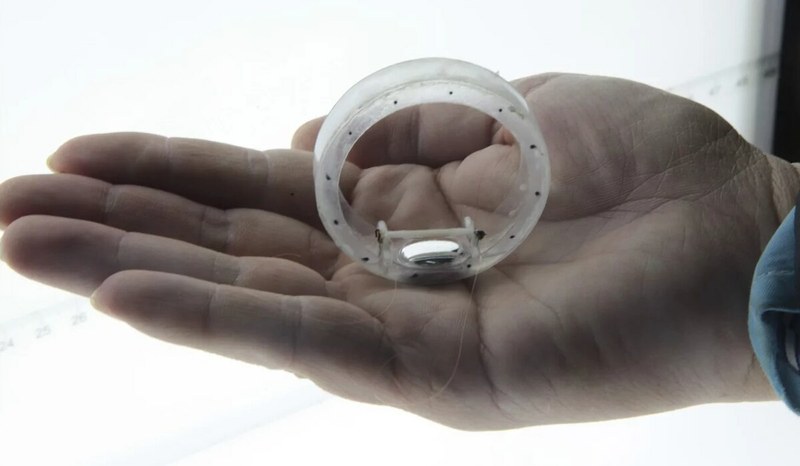 Consider, then, the latest in soft robotics from China’s University of Science and Technology and Australia’s University of Wollongong: a miniature wheel, driven by sending electricity through a blob of liquid metal. Here’s how the robot works: a droplet of liquid gallium alloy is placed inside a small wheel, and on top of it sits a specially 3D-printed bracket containing a cathode and anode. Altogether, this makes up the robot. When voltage is run through the liquid metal droplet, it changes the robot’s center of gravity, so the robot rolls forward steadily. According to the researchers, this can work untethered using a tiny cylindrical lithium battery, with the robot rolling on a flat surface. Plenty of wheeled vehicles already exist, but few of them work on such a small scale, or with such a narrow frontage, which is what’s so compelling about this tiny machine (well, besides the fact that it’s a liquid-metal powered robot). Everything interesting comes from adding sensors to the body, but imagine what a tiny machine like this could do with even the simple addition of a microphone and a transmitter. Slide it through a narrow crack, and the robot could roll into place, a listening device drawing power from the same small battery that enables locomotion. Keep the robots small enough, and they could fit into pouches and pockets, rolled through underbrush or down side streets, small enough to escape notice.